The French were almost certainly trolling President Donald Trump two days after inclement weather led him to cancel a planned visit to the Aisne-Marne American Cemetery. A century and some change after bugle calls for cease-fire drifted over European trench lines, the French launched a salvo. 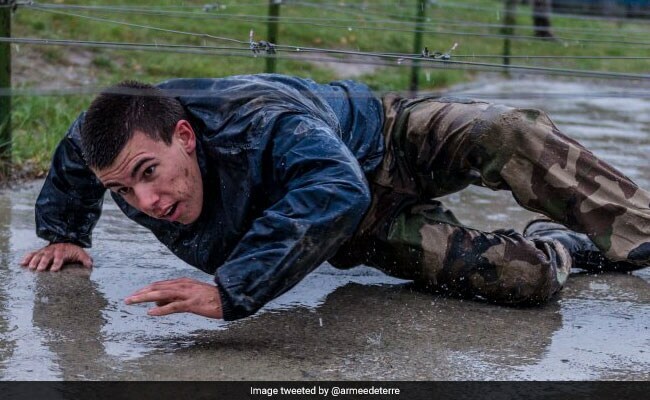 "There is rain, but it does not matter," the French army said Monday on Twitter, alongside a photo of a rain-soaked recruit crawling through an obstacle. "We remain motivated." The French were almost certainly trolling President Donald Trump two days after inclement weather led him to cancel a planned visit to the Aisne-Marne American Cemetery - a verdant hillside shrine of arcing headstones that mark the final resting place for 2,289 U.S. troops, many of whom were killed in the Battle of Belleau Wood. The names of 1,060 more who were never found are inscribed on a wall there. The White House canceled the visit, which would have been aboard the presidential helicopter Marine One, after it was determined that the conditions offered "near-zero visibility," White House press secretary Sarah Sanders said, amid criticism and speculation that Trump was not motivated to join other world leaders there by car instead. "President Trump did not want to cause that kind of unexpected disruption to the city and its people," Sanders said. The cemetery is 50 miles outside Paris, and it was not clear why alternative routes - commonly planned for high-profile events - were not used in this case. The weather did not prevent Canadian Prime Minister Justin Trudeau, German Chancellor Angela Merkel and French President Emmanuel Macron from visits to other sites around Paris. Gen. Joseph F. Dunford Jr., chairman of the Joint Chiefs of Staff, and White House Chief of Staff John F. Kelly visited the cemetery on Saturday - a day and a place layered with deep significance to U.S. military history. Saturday was the Marine Corps's 243rd birthday, and the men - both Marines - walked the cemetery on the edge of Belleau Wood, which quickly became central to Marine lore after the 1918 battle. Four days after the German withdrawal, the French Sixth Army issued an order renaming Belleau Wood "Bois de la Brigade de Marine." And in April, Macron gave the White House an oak sapling from Belleau Wood, where, he said, "the blood [of Americans] was spilled to defend France." German troops nicknamed Marines "Teufel hunden" - devil dogs. The name stuck. Bulldogs have become the mascot of the Corps. Now Marines who visit the cemetery and battlefield are drawn to the village of Belleau right outside, where a moss-flecked bulldog fountain spurts water from its mouth. It is customary for Marines to drink from it, in homage to the Americans who never left the wood.